I hurriedly tamed them with my brush! The bodega door waits its turn! Stay tuned; there’s more on the drawing board! For what started out as an accident, this is fantastic! It was meant to be. And by the way, congrats on the award from Let’s Be Wild, that’s a beautiful photo of the sailboats. Thanks, Amiga! You are so kind and thoughtful! 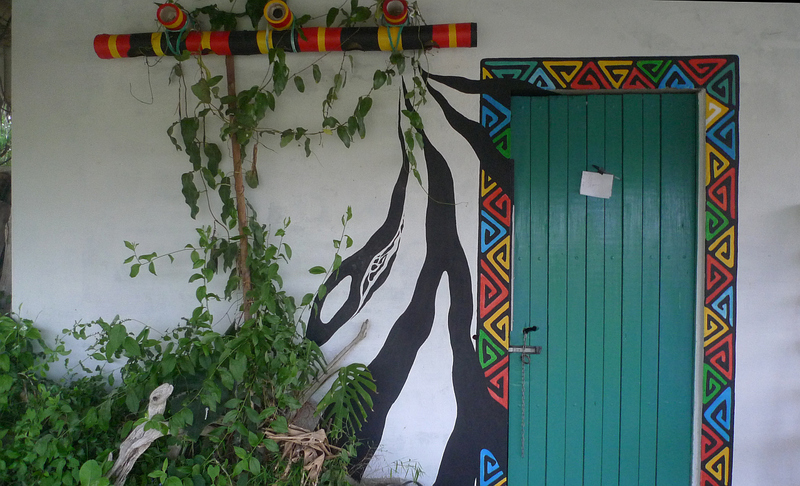 I had planned to paint the border around the door – just not so soon! There’s also a large painting patiently waiting for me to finish, though I enjoyed the detour! Hi Z, another one of your creative surges that ends in our enjoyment! The bamboo fixture is one of a kind! Keep up the great ideas…and sharing! Have a super weekend! thanks for your comment and yes, it was a great creative weekend spent with friends. i will probably do more work in that area this afternoon. Another instance when I wish there was a LOVE button! So creative, it is very organic looking, Is there more to come? there is always more, which is such a luxury with an old fixer-upper! when it’s a basic shell of a house, anything is an improvement! it’s been a great fun project that continues to evolve. today i worked in the garden and am ‘spent’!!!! hey! it’s 4 a.m, and i am up for a fast cyber check b/c it’s been raining for hours. most likely we’ll lost power before daylight. the garden is ‘young.’ until this year, it has not been ‘goat proof,’ so the goats stripped it back to bare ground whenever i was gone. it’s coming along well, and i’ll try to get some photos for you asap. i would do better sharing photos of the costa rica gardens!!!! the art gallery/pub meal outing sounds great! around noon today i’m going to town to meet friends who arrive from the port city of manta. we’re staying at my friend luchy’s hostal. they’re here for only 24 hours, then back to manta and responsibilities of work! Yes I remember the photos you shared with us of the goats, cute to look at but much more destructive than the grasshoppers and caterpillars that are my main scourge. each year i would return after a 3 to 6 month absence and have to start all over again… and again.. and again! i remind myself if that’s as bad as my day/life gets, i am lucky! every so often a goat gets around the edge of the fence via the river rocks/boulders, but i am almost always home to catch ‘him’ and chase him from the yard! how wonderful! i smile at the thought! i’m listening to this – (late at night a music video will play, but in the daytime, too many users clog the system. You continue to amaze and dazzle us! We have to make it down to Jama to see all of your creations! it would be so great for you two to journey to jama! we’ll have to meet in bahia sometime soon and bridge that distance! i haven’t ‘loitered’ in bahia in months! The light fixture is incredible….so colorful & i love the freeform black with the patterns. thank you! my very talented friend, luchy, made the light fixture, and after years in the sun, it needed a facelift! i’m glad you enjoyed seeing it! Approve?? It’s brilliant! Well done. How inviting! thanks so much! i’m glad you liked the results! Speaking of Rorschach, it looks for all the world to me like a person walking toward that door, with a cape flying behind. See the legs and arms? You can’t see her head because it’s in the clouds – just like someone else we know! The power was out earlier today, and then I went to a friend’s house to help with a remodeling project. I returned to find lots of fun comments, though yours made me ‘burst out’ laughing! For some reason, Lucy in the Sky with Diamonds will be playing through my head for the rest of the day!!!! You are so right! That’s a great graceful essence of a person strutting toward the door! Thanks so much for this injection of humor! 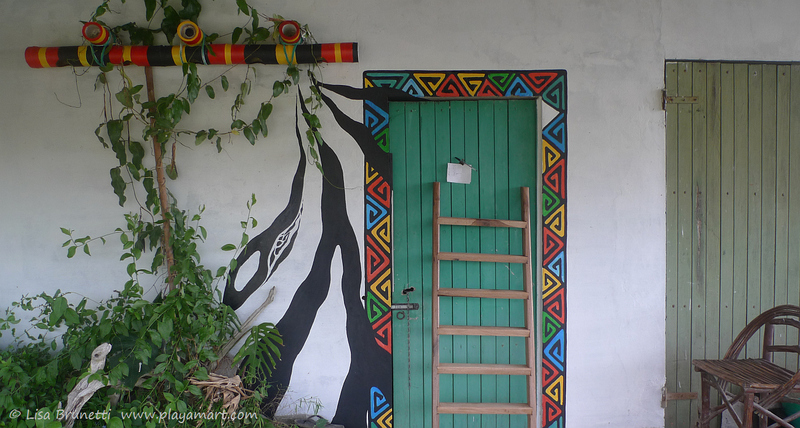 Perfect ending to a oops moment – very appealing and intriguing doorway. You’ll receive many cool comments for sure. one really cannot see the doorway until stepping under the thatched ‘ramada.’ so the door is a surprise! What fun you are creating with your life, Lisa. Thank you for sharing your inspirations with us! Yikes! I won’t even ask if he was wearing leather gloves without holes, or was standing on a fiberglass ladder. Hopefully, he turned off the main breaker for the entire town before he started working (our ideal preference!). So much happiness here! It’s just wonderful. You really did tie everything together. It will be interesting to see what it looks like as the vine grows and changes shape – and I wonder how it looks at dusk, when the lights come on but you can still see the colors? And as a photograph for its own sake I love it with the ladder, and also the note on the door. you are so observant! an electrician finally showed up yesterday and fixed a wiring problem, so now the light works! last night was the first time to see it, and it looks quite sweet. wrens have already claimed one of the bamboo holes for a nest! i’ll try to remember to take a photo tonight! Ahh, the “happy accident”, which we really know is the creativity of the artist making something wonderful out of an oops! Great Job, Z! Thanks, Ruth! As you know, dashing to get the camera for a ‘before’ photo was not an option! I loved your guest post and agree totally, especially about strengthening math skills. I also treasure what Betty Edwards has done for understanding how some people figure it out and others need to be guided! I love it!! Love the colours!! Gives me an idea of what to do with all the bamboo I have in the back yard! You are so creative! I love, love it! So beautiful! You’re amazingly creative! I do approve. In fact a light fixture and door like that on my house would be so much fun. What is that saying: “There are no accidents?” Especially not for someone as creatively talented as thou! It looks fabulous. What a great light fixture too. thanks! it’s nice when one doesn’t have to worry about neighborhood zoning laws! the creative whims are fun and remind us all to keep that childlike whimsy in our hearts! thank you, nancy! sometimes it’s nice when the only person that needs to approve if the person creating the art. there are no ‘reins’ on ‘should i or should i not’ – just paint for the joy of painting. if it looks horrid, then a repaint job is an easy fix, and no one has to see the goofs! A classic “lemons to lemonade” piece of art. Very cool Lisa. thank you! hmmmm; i’ve been working in the yard all afternoon, and a lemonade sounds lovely! thanks! it’s a fun project – the house – and it’s hard to stop.. ideas spring in all directions! thank you! i worked on paintings this morning and in the yard this afternoon. i am ‘spent’ and am going to eat and crash for the night! thank goodness we can recharge the batteries and start new each day! Love it! There is always a way to take advantage of an oops! Love the light fixture! Brilliant! I have a tie with fish and I love the fish screen! i planned to work on it last night, but i was tired. there are so many creative options each day – there’s not enough time! i need three or four lisas! i’ll bet you need three or four barbs as well! ha! i laughed! yes, sometimes it’s nice to claim multiple personality disorder. i saw this as i type from the window seat and watch the birds. the birds are claiming more of my attention than the post i am working on! Have a great day! Going off to work early as our roof is being replaced…need to head out before I get blocked in.